EcoCustard Styling Cream Express Your Style! 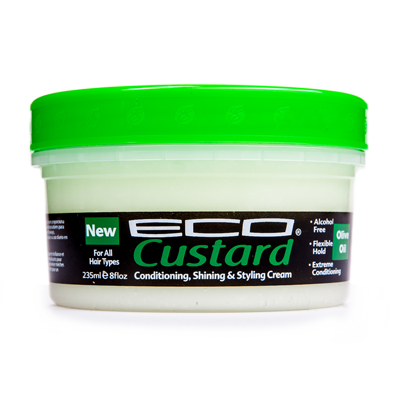 Eco Custard Conditioning, Shining & Styling Cream provides superior shine and styling flexibility. Infused with oils and conditioners to protect, hydrate and nourish your hair. Safe for daily use on all hair types. How To Use Apply to dry or wet hair. Work desired amount through hair and style. Ingredients Purified Water (Aqua), Fruit Oil, Argania Spinosa (Argan) Kernel Oil, Emulsifying Wax NF, Glycerin, VP/DMAPA Acrylates Copolymer, Sodium Hydroxymethlglycinate, Polysorbate 80, Polyquaternium-70 (and) Dipropylene Glycol, Lanolin, Carbomer, Triethanolamine, Parfum,Tetrasodium EDTA, d-Limonene, Quaternium-15, Hydrolyzed Wheat Protein, FD&C Yellow 5.